Most orders placed before 2pm Tuesday - Friday day, will be sent the same day. During busy periods orders may take slightly longer to be despatched. If you select EXPRESS SHIPPING at checkout, all orders placed before 2pm Mon-Fri will be guaranteed to be sent out the same day. Orders placed after 2pm or over a weekend or bank holiday will be sent out next working day. When placing your order you will be given an estimated window that your parcel should arrive in. We use DPD and Royal Mail for all UK Mainland deliveries. If you selected REGULAR SHIPPING your parcel should arrive the next working day after it is sent but can take up to 3 working days. If you select EXPRESS DELIVERY when you check out, your parcel should be with you the next working day by noon if sent with DPD and 1pm if sent by Royal Mail. A working day is between Monday and Friday and excludes weekends and bank holidays. What is classed as UK Mainland? Express shipping can be specified at the checkout stage, and applies to all items except cartons of Reeves and Winsor & Newton canvas and large studio easels. When you select Express Shipping it means that your order will be sent out the same day if ordered before 2pm on a working day and will be sent on an express service. Express delivery to UK mainland addresses will arrive the next working day before noon/1pm providing the order is placed by 2pm the day before. Orders placed on Friday after 2pm, Saturday or Sunday will be despatched on Monday and express delivered on Tuesday morning. PLEASE NOTE: A separate contract is being entered for express shipping when it is being requested. Per the distance-selling act, you do have the right to cancel within 7 days, but not once the express service has started. In plain English, the cost of express postage would not be refunded if the product was returned, unless the goods delivered were faulty. It is possible to cancel the express shipping as long as the order has not been shipped. Can I get my Loxley Cartons of Canvas by Express Shipping? The larger sizes of Canvas cartons are sent out direct from Loxley. If you are ordering other items with your canvas carton which you also want on an express service there may be additional charges. If this is the case we will contact you upon receipt of your order. Where do you class as the Highlands & Islands and Channel Islands? Highlands & Islands are defined as those UK address with a postcode in the following range: AB36-38, AB55-56, BT, FK17 - FK21, HS1-9, IM, IV, KA27-28, KW1-17, PA20-78, PH19-50, TR21-25, ZE. Why you charge more to send to the Highlands & Islands and Channel Islands? Royal mail have a universal charge for all of the UK, but the couriers have different charges for certain areas. We can send small light parcels by Royal Mail and therefore charge the same rate as UK Mainland. If an order conains any kind of solvent based product, eg. Oil paints or mediums, we have to send the parcel by DPD. For heavier/larger parcels, or those containing items which Royal Mail will not take, we use a courier. All couriers impose charges around double the normal cost of shipping to the UK mainland for post code areas listed above. For this reason we have to add a small cost towards this. Can you send my parcel on an Express service? Unfortunatley at this time we do not have an express service to the highlands & islands or the Channel Islands. For a guide to the cost of shipping please see below. If you find that the shipping for your order seems expensive, you can try editing your shopping cart to see if that reduces the charge. Taking out heavy or large items will reduce the shipping charge. Parcels up to 2Kg and less than 18" x 15" and do not contain any solvent based items such as oil paints and oil mediums going to western Europe except countries listed below. Small packets sent by Royal Mail have tracking details which will be emailed to you. Where it is less expensive to send your order by DPD carrier, we will use the less expensive service. See Carrier prices below. Parcels between 2Kg and 25Kg and/or larger than 18" x 15" or contain any non-flammable solvent based items such as oil paints and oil mediums. The prices in the table below are for DPD road transportation with tracking details. Please note: There are certain oversized items such as large studio easels and big cartons of canvas which can't be shipped outside the UK. You will be notified if you have any of these restricted items in your cart when you set your country. * If your country name does not appear on the above list, please see Rest of World section for postage. You will be sent an email when the goods are collected by our delivery company with tracking details if applicable. *all delivery dates are approximate. On rare occasions, parcels may be subject to delays, a parcel is not considered lost until 25 days after dispatch. We do not have an express service to the outside the UK. All orders are insured against loss and damage. Parcels up to 2Kg and less than 18" x 15"
Please note: We are unable to send any flamable items such as solvents and aerosols outside the UK. You will be notified if you have any of these restricted items in your cart when you set your country. All small parcels sent by Air Mail will be going on a "signed for" or tracked service which is more secure. We will use the tracked service usually as long as the destination country can deliver that service. ​*We will send certain watercolour brushes by air mail at our discretion and notify you when doing so. Orders under 0.9Kg which are not going on the Express service will go by air mail and will usually take 6-11 working days to arrive. Small packets sent by Royal Mail have tracking details. Parcels between 2Kg and 20Kg and/or larger than 18" x 15"
Larger parcels are sent by courier and have tracking details. You can now ship your order using FedEx priority service from £11.99 and your order will be delivered in approximately 2 - 3 business days from placing your order*. (Excludes PO (Post Office) Box number addresses) *We will send certain watercolour brushes by air mail at our discretion and notify you when doing so. Please note: There are certain oversized items such as large studio easels and big cartons of canvas which can't be shipped outside the UK. We are also unable to send any flamable items such as solvents and aerosols. You will be notified if you have any of these restricted items in your cart when you set your country. 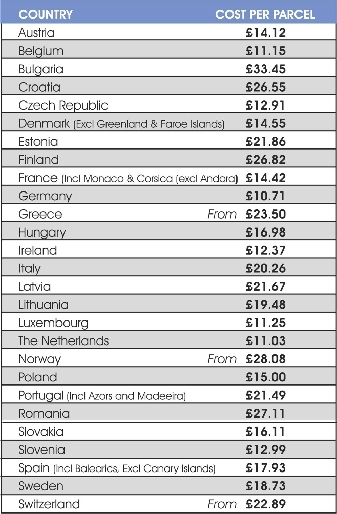 The prices in the table below show the postage costs of a parcel to the countries listed. The following prices are as a guide only. You will see the exact price when you add items to your shopping cart. *all delivery dates are approximate. On rare occasions, parcels may be subject to delays, a parcel is not considered lost until 25 days after dispatch. We do not have an express service to destinations outside the UK although all parcels are sent by air transportation. At the moment, due to difficulties our couriers are having with getting goods into Russia, we are only able to send out orders weighing less than 2Kg. We remove VAT from all orders paid for and delivered outside the EU. Parcels may be subject to custom charges when entering your country. These rates are subject to the individual countries local taxes where applicable. Please use this PDF as a guide to customs and handling charges for different countries. Please Note:- Some countries outside the EEC have restrictions on goods entering the country and may charge a fee to inspect any goods which might be restricted. As this varies from country to country, it is impossible for us to accurately supply any information for individual countries. If you think there might be a problem, please check on any import restrictions in your country. It particularly applies to natural products such as wood and animal hair. 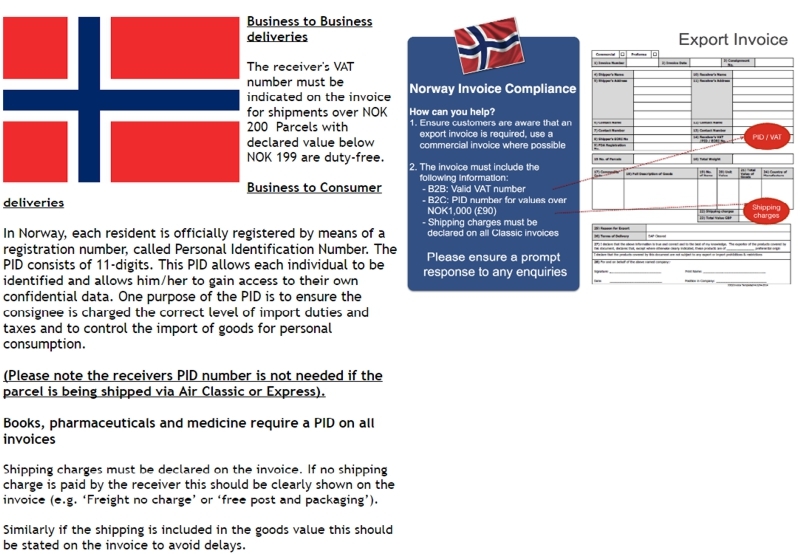 Please see the image below explaining the Norway customs information required. PID is not required for parcels sent by Air, but for very heavy parcels sent by Road, then the PID is required. We will email you if this information is required. If you try to order a product that is out of stock, or if you order more than we currently have in stock, you will receive a warning. If you proceed with the order, the products which are in stock will be dispatched as normal. If the out of stock item is back in stock within a couple of days, we may hold the order and then ship the complete order. Any products which are not presently in stock in many cases will be dispatched when they come into stock, with no additional shipping charge. There are some exceptions to this rule and we will contact you if extra shipping charges are required. If there are extra shipping charges and we are unable to contact you, then we will refund the items not in stock and send the rest of the items.